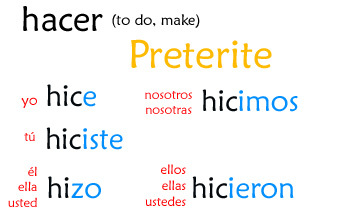 This video lesson covers yet another verb irregular in the preterite: hacer (to do, make). Enjoy! Feel free to leave questions/comments/suggestions about this video below. For a summary on the preterite, check out the preterite conjugation sheet! Very good. what about Hace? Lo siento. I’m afraid I don’t understand your question! Very nice! Helped me a lot with my homework. Also could you possibly teach me what green screening technique you used to do this? I see a small green outline so, yea. Thanks! Not sure what ‘technique’ you’re referring to. If you mean how do I get the green screen to work, I’ll be making a video to show you how I make my videos coming soon in a few weeks! I double checked with native Speakers and as I suspected, both are correct. If you say ‘Yo hice la cama’ it’s understood whose you made. If you want to make sure people understand (or emphasize the fact that you performed the action) you can add the ‘mi’ or ‘tu’ or ’su’, etc. Gracias para los leciones (sp?). These verbs are getting pretty tough to remember. Anyway, I noticed the cheat sheets below the video weren’t changed from the previous ‘hacer’ page. Thought you should know. ¡Gracias! I’m a fan of your lessons. You make it seem simple (less daunting) when it’s so complicated! How do you know whether to use ‘su’ or ‘sus’ for his, her, their? Is there a video on this? Also, when translating ‘I made my bed’, how come it is simply, “yo hice la cama’ and not “yo hice mi cama”. Can you include the vosotros/as form in the practice during the video? Thank you and I look forward to your next video.